David Torrance is a journalist who irritates me more than he ought. Not that that's his problem; it's mine entirely, I ought not to allow myself to become so annoyed. But he is, for me, the exemplar of Scotland's tall poppy syndrome: see anyone talented, competent, able beyond what Torrance believes to be their deserts, and he will attack. His attacks are subtle: he uses innuendo, faint praise, dismissive reference, imputation of ill motives; never, as far as I'm aware, outright verifiable falsehood. I suspect he checks his facts carefully - indeed he must do so, since if he did not he would surely find himself before the courts on a regular basis. He's also - viciously - tribal. His detestation of the Scottish National Party bleeds through every piece he writes; his praise for the Labour right is lavish and unstinting. At least it could never be said of him that he pretends to balance. Instead, he pretends to erudition. In today's scrawling in the Herald, he casts himself somewhat incongruously as a bible-thumper, making heavy reference to Deuteronomy; and, in case his audience is so unlairit as not fully to appreciate his facile cleverness, when he quotes from the Gospel according to Luke, he very helpfully cites chapter and verse. Oh, yes, actually, this sort of stuff is quite fun to write - not constructive or illuminating, perhaps, but quite fun. I think I could manage a fair parody of a Torrance piece, if I set my mind to it. But today I owe him a debt of gratitude, since he's irked me sufficiently to drive me to write this essay. And so I'll deal with his drivel in two short paragraphs, and move on to the meat of the matter. Yes, David, Alex Salmond has had a number of 'pops at the BBC'. In which, let's agree, he's entirely justified, since even neutral academic studies have established beyond any doubt that the BBC's coverage of the referendum campaign was anything but fair, unbiased, or impartial. No, David, it doesn't matter whether or not you 'rather doubt it was the official figure of 12,000' attendees at Nicola Sturgeon's rally, since it's a matter of record that there were twelve thousand tickets, and every one of them was sold. No, David, of course neither Nicola Sturgeon nor Alex Salmond - nor anyone else on the stage in the Hydro - mentioned what was going on a scant 250 metres away in the Armadillo. As the government held it's - justifiable - celebration in the Hydro, the opposition were meeting across the way. The left was meeting across the way. The trades unionists were meeting across the way. 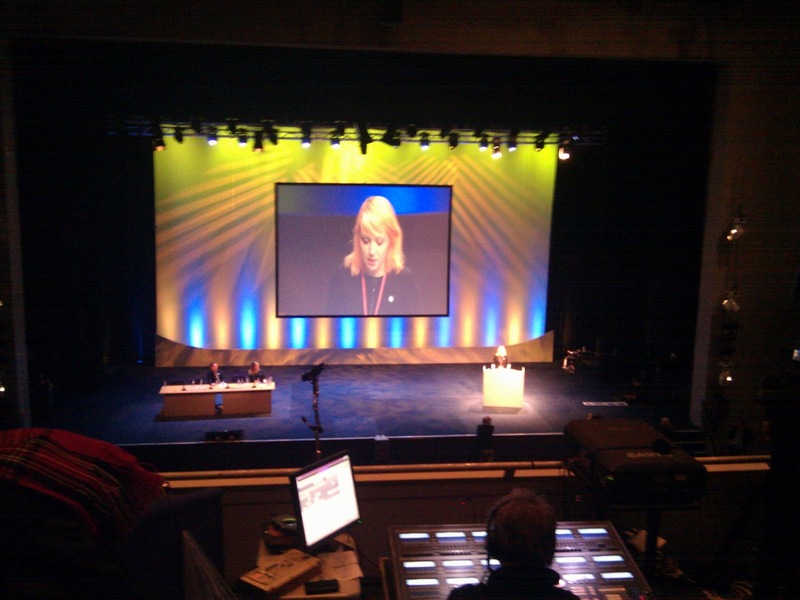 The political voice of the working poor of Scotland was being heard across the way. And very few - very few - of the people's party were there. Labour isn't in government in Scotland, David; it isn't even in opposition. It is tearing itself apart on the sidelines faintly pursuing the Liberal Democrats into the wilderness, while the new battle lines of Scottish politics take shape: the SNP in the centre ground, the tattered remnants of the unionist parties on the right, and something new and not yet fully choate on the left. And that's what I came to talk about. I can't tell you what the SNP got up to in their mass rally, because I wasn't there. I was in the Armadillo, and the Science Centre, and the implausibly named Crowne Plaza (seriously? In Glasgow? ), discussing the strategy and objectives of the new Scotland. But I'm getting ahead of myself. This piece doesn't start with Saturday, but with a Thursday two and a half weeks ago in Oban: with the Scottish Rural Parliament. The Scottish Rural Parliament has emerged out of a civil society project organised by a group of people who are undoubtedly well motivated, but who I feared might be naive. The attendees were largely self selecting and not in any meaningful sense representative. Consequently I'd gone there expecting to be a lone voice crying in the wilderness; I'd expected the event to be top-heavy with lairds and their lackeys. I'd gone there very grateful for the company of a friend who's a Green party activist. I was, not to put too fine a point on it, feart. I should not have worried. The left was well represented: by the Tenant Farmers Association, by crofters' groups, and by a motley band of academics, housing association people, Green Party people, and the wilder fringe including myself. Two of the most significant people on the rural Left, Andy Wightman and Lesley Riddoch, were leading sessions. The reason I haven't written about the event before this is that I'm pretty dissatisfied with myself with the use I made of it. I managed, through being disorganised, to book a session which clashed with the one - on local government reorganisation, an important matter and near to my heart - that they led together. And I managed also to miss most of the evening socialising where useful conversations might have been had - but probably not by me, since I've never been good with crowds. In saying that I managed to miss Lesley and Andy's session, I went instead to a session on land reform run by some public affairs consultancy on behalf of the Scottish Government. That was the one part of the whole thing that really bothered me: I had a strong feeling that the session was being consciously structured to exclude the possibility of hearing radical suggestions. However, the event as a whole was a good one, well organised, with a broad cross section of rural Scotland, the poor as well as the rich, the left as well as the right. And government ministers were there, palpably listening. What most impressed me? Well, Lesley and Andy, of course. I frequently cross swords with Andy, but I hope he knows that I think him one of the most important thinkers, researchers and activists we have. But also, to my surprise, Councillor David O’Neill, an old Labour man, chair of COSLA's commission on Local Democracy, who gave a witty, modest, practical and very human outline of the problems and challenges of local government in Scotland; and the organisation (by a Danish facilitator whose name I didn't note) of Friday afternoon's highly interactive discussion sessions, in which we worked in small flexible groups across a wide range of key policy issues. Oh, and, I think I live in a beautiful part of Scotland (well, I do), but the landscape around Oban is stunning. And so from the magnificence of Argyle to the stark grandeur of the Finnieston Crane. I met many of the people I had worked with at the Rural Parliament next on Saturday in Glasgow, at the Radical Independence Conference. RIC is effectively bridging the rural/urban divide, bringing together the left from across Scotland, and I honestly believe we will achieve a policy platform which will build broad support across the nation. So, thoughts on RIC: I'd hoped for a working conference which would make policy, but it has essentially grown too big for that. To have a useful discussion with three thousand people is impossible; even the smaller breakout sessions, at two hundred or more people each, were too big for real interaction. And so it was mainly speakers from platforms, delivering speeches. The plenaries I'll come back to; patience. I attended (of course) the land reform session - entitled 'Ending feudalism now: why we need radical land reform' - which was led (of course) by Andy Wightman, but with someone I hadn't heard before, Jen Stout from Fair Isle. That session was interesting not merely for the 'platform' (it was a table) addresses, but because we actually managed some real discussion - not, under those circumstances, very free flowing, but some. I attended a session which advertised itself as 'new media', but which led off with a long (interesting) address by Paul Holleran, Scottish Organiser of the NUJ, mainly about the BBC and about the new daily newspaper, the Nation. There was also an interesting section by Angela Haggerty of Common Weal on their new collaborative news platform (which hasn't really launched yet, but sounds as though it may be promising). And finally I attended a session on the Common Weal, led by Robin McAlpine; the first time I'd seen the whites of his eyes. The session as a whole was interesting, but it reprised a lot of what I'd already heard from Angela Haggerty, so for me I used it most to form an opinion of Robin. I'll admit I've been wary of him. The last thing the left in Scotland needs is yet another charismatic egotist. Citizen Tommy and Gorgeous George have between them done incalculable damage. So it was a relief for me to see that Robin was too much an intellectual, too self aware and introspective, to fall into that trap. Which brings me to the Curious Incident of the Dog in the Night-time; to Jonathon Shafi, the other person to emerge strongly on the left in Scotland over the course of the referendum campaign, the other person who might conceivably have tried to follow in Tommy's and George's footsteps. To be honest I didn't expect him to, I've already seen enough of Jonathon Shafi to know he isn't an egotist; but the extent to which he didn't bark surprised me. He didn't speak in the plenaries except, in the opening plenary, to introduce speakers. He did apparently lead one (well received, I hear) workshop, but I didn't attend that. Those who did speak in the plenaries, though, revealed the strength in depth that we have. Aamer Anwar spoke: mostly a tirade against Labour, which won rapturous applause but was I think tactically a mistake. Patrick Harvie for the Greens spoke well, of course, it goes without saying; Colin Fox of the SSP, too. Tariq Ali, beside whom I last stood at a meeting in Birmingham in 1973 as we tried together to prevent what was supposed to be a broad front campaign in support of the left in Chile being taken over by one of the more doctrinaire Marxist-Somethingist factions, inspiringly, as, from long experience, he can. But all these seasoned politicians were eclipsed. It would be wrong to ignore Myshelle Haywood, one of many from across the Atlantic who have come to Scotland for our culture and stayed because of our politics, and who spoke well and fluently. It would be wrong to ignore Alan Bissett, who gave us our vow. It would be wrong to ignore Sarah Beattie Smith, who chaired the closing plenary with grace and confidence. But abune them aa, there were two real standout stars. In the opening plenary, Saffron Dickson shone. She spoke too last years' conference; I think if I recall correctly she said then that it was her first time speaking to a large audience. Well, this year wasn't. Her performance was confident, assured, witty, fluent, passionate, eloquent: extraordinarily assured for one so young. Yet in the closing plenary even that was eclipsed. We know Cat Boyd can speak: we've seen her do it before. But, she did it. She earned her standing ovation. Alex Salmond apparently said, that day, in another place, that Nicola Sturgeon is the most talented young woman in Scottish Politics. I have the greatest of respect for Alex, but he was wrong. The left now has at least two - these two - who outclass her. And they're both younger, with much more ahead of them. When shall we three (thousand) meet again? There have been a number of good think pieces on RIC written in its aftermath; I particularly commend to you Peter Arnott, Jonathon Shafi, Adam Ramsay, Sarah Mumford and Libby Brooks. There was another that I meant to link to written by a female Green activist on the train home, but I can't now find it - if anyone recognises it from that description please tweet me and I'll add it! There's even a surprisingly good straight piece from the BBC. What do I take away from it? Well, as Jonathon Shafi has said, it proves that we can have competent organisation and a great deal of common purpose on the left; factionalism is neither inevitable nor useful. we need to get serious talking done about policy, and a massive event like this doesn't do that. So we're going to need working groups, and we're going to need working groups well before next years conference. Which, from my point of view, really means I need to get a rural policy working group together and actually happening. I'm inclined to do that under a RIC banner rather than under a Common Weal banner, but frankly it's more important to get the right people talking than what banner we meet under. RIC is, as I said at the beginning of this piece, yet inchoate. In it are the seeds of Scotland's future: in it is the hope for Scotland's future. Will it emerge as a political party? I don't think so. Six months ago I hoped it would, now I hope it will not. I hope the future of politics in Scotland is not a future of party, tribalism, faction, but a future of a loose and changing tapestry of individuals and groups with bonds of understanding and mutual respect, which know they don't always agree on everything but know too when and how to come together in common cause: and if that is the future, then RIC is the embryo of that future. We must nurture it. But it will grow.